PokerStars' latest innovation allows players to literally Unfold their hands. PokerStars has found a way to turn back time. Not literally of course, but the online poker giant’s latest innovation, Unfold, gives players the opportunity to possibly correct a big pre-flop mistake and go back and unfold their folded hands after seeing the flop. Here’s how Unfold unfolds: Pre-flop play takes place like it normally does in No Limit Hold’em. Players opt to play for the main pot or click the fold button and, like normal, the flop is dealt. If a player sees a flop they wish they would have kept their cards for, they can change their mind and “unfold” their cards to play for a side pot called the “Unfold pot.” The Unfold pot is made up of antes taken from each player at the beginning of every hand. The ante size, and thus the Unfold pot is determined as a percentage of the big blind. The players who unfold have a make a bet equal to the size of the Unfold pot. Then, it’s a game of wait-and-see as the rest of the hand plays out. There’s no further betting for the Unfold pot and those who are still in the standard main pot will continue to play out the hand as they normally would. Those who have an interest in the Unfold pot are spectators to the rest of the hand and watch as the turn and the river are revealed. After fifth street, the player with the strongest Unfolded hand wins the Unfold pot. If by chance, those playing for the main pot conclude the hand on the flop or turn, the remaining streets will still be dealt to determine the winner of the Unfold pot. Not every hand is going to have an Unfold option. If the pot is determined pre-flop or if it’s more of a family pot with fewer than two players folding pre, the option is void. Also, once the flop is revealed if no players actually opt to unfold, then the side pot goes away. In all of these cases, the ante that is taken from each player is returned to them. One of the players who will be mixing it up in the limited-time format is PokerStars Ambassador Fatima Moreira de Melo. 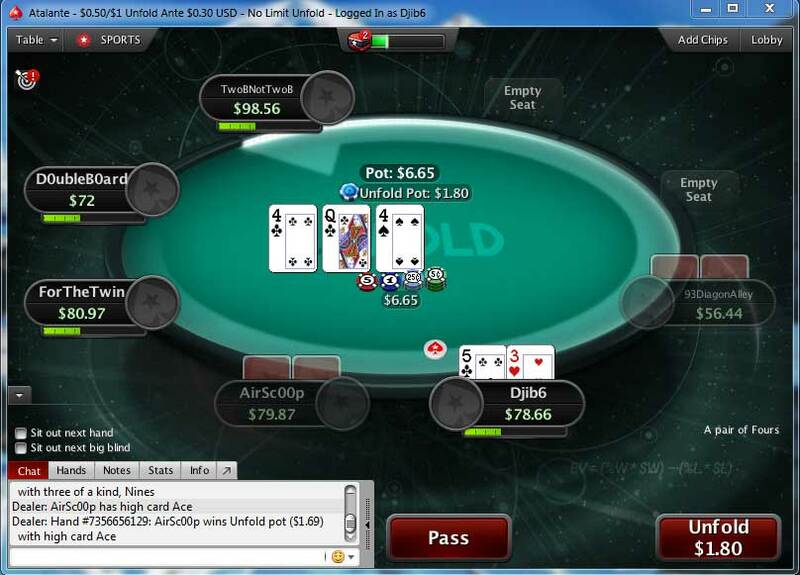 Unfold is currently available under its own tab in the PokerStars lobby on the majority of PokerStars clients.